On Tuesday Martin and I went to Front Royal to see Adam play in a soccer game. The game wasn’t until 4:30PM, so we spent the early afternoon junking. As you know from a previous post, I think soccer and junking go together like wine and cheese. We hit a couple thrift shops and I scored some treasures, but it never ceases to amaze me how great everything looks at a distance and how down right awful it looks up close! We had a blast wading through the flotsam and jetsam anyway. Usually on Thursdays I stay around Bowling Green and work at home. You can find me washing, ironing, pricing or making stuff for my shops. I also throw in some mundane housework like laundry or cleaning. Ho Hum right? Well not today people!!! Two days ago I noticed a yard sale sign a couple blocks up the street from me. It said the yard sale would be on THURSDAY, Friday and Saturday. Did you get that? Thursday!!! That was today! Did I go? Not only did I go, I went too early and they weren’t even open yet. Okay, I know, I have to chill a little. I went back at 8:15 and they were ready for me. I got some really cute stuff. So do you want to see what I got this week? 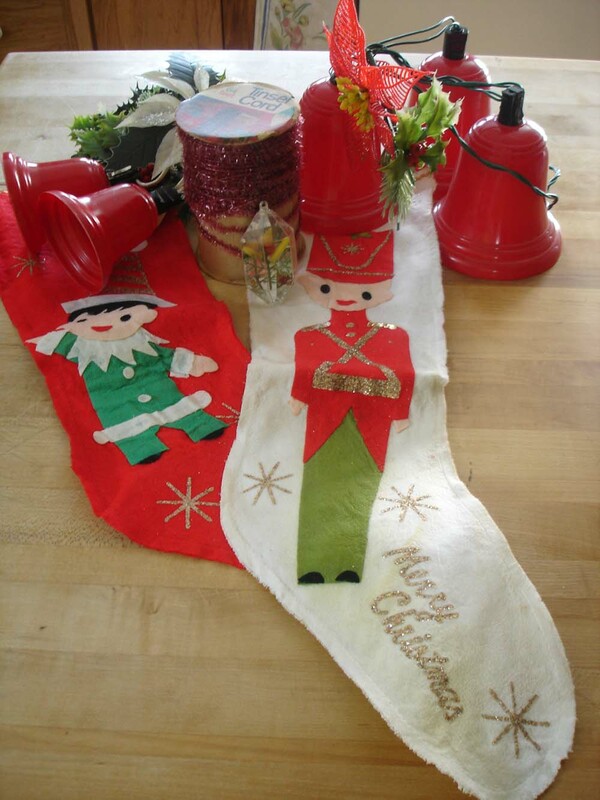 1960’s Christmas kitch. This was my childhood! Two cute felt stockings with GLITTER accents. Two sets of plastic light up bells with tacky plastic pointsettas on top. Please note that the pointsettas have GLITTER on them. It’s hard to see in my amazing picture (I know, I should work for National Geographic, right?) but there is also a cute little plastic ornament with plastic fruit in it and half a roll of dark pink plastic tinsel cord. The operative words for what I love to sell at Christmas are plastic and glitter as long as they are tacky tasteful. Next we have an awesome cake stand with top. I can’t leave these alone. I will add a decoupaged hang tag to the nob on top. Maybe I’ll show you in a later blog post. The pretty tin is staying in my studio. It’s hard to tell from my picture, but it is designed to look like needlepoint and is covered with roses. Need I say more? There is a little white birdhouse which will get the “Helen” touch too. 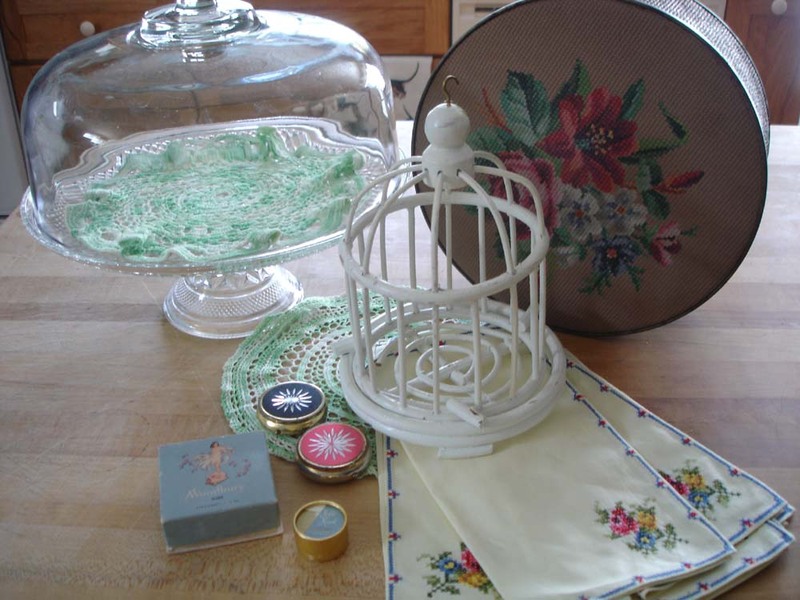 A cute set of green doilies, needlepoint napkins, 2 vintage pill boxes and 2 small old powder boxes finish off this set. Nice. Now we have a little child’s suitcase. No, I am not selling it. EVER!!! It will be a great display piece for shows. 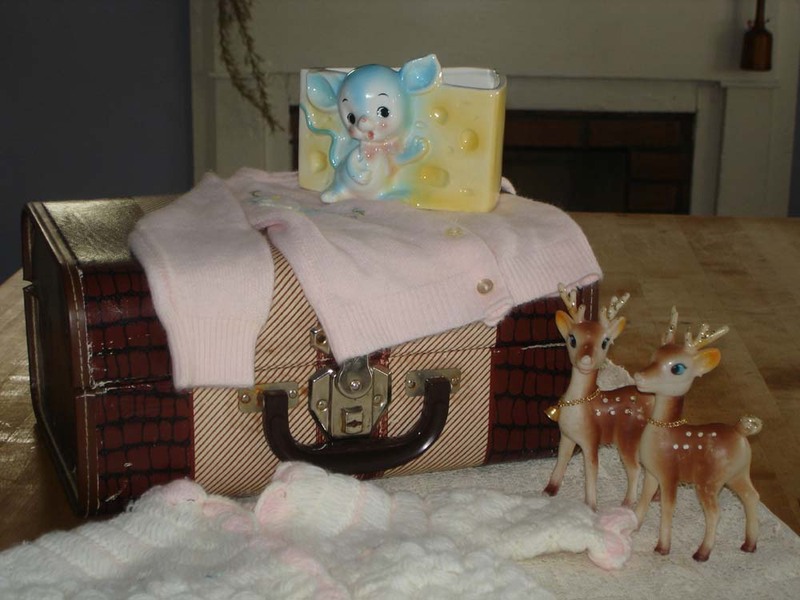 There are two vintage baby sweaters, two vintage plastic (there we go again) reindeer and the cutest “Made in Japan” vase with a mouse and a cheese wedge. I love these fun old vases, especially the ones with baby themes. I guess this would count as one of those if you were a mouse. 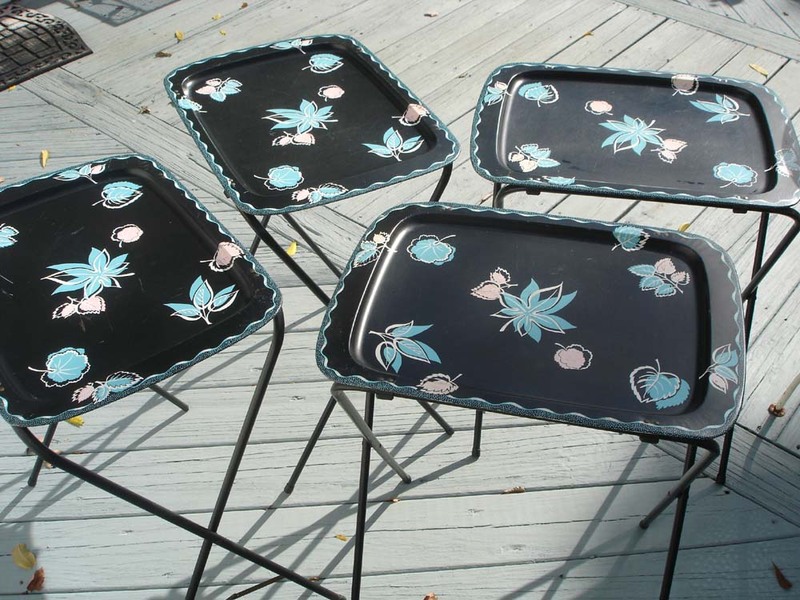 Lastly we have this awesome set of four 1950’s metal (not plastic) tray tables. How cute are these? The tables are black with pink and blue leaves. My heart almost stopped when I saw them at the yard sale. I had to have them. They will be going to my Fredericksburg location tomorrow!!! All in all I had a really blessed week as far as shopping for Mossy Cottage went and I got to enjoy some of the most beautiful fall days to boot. Not bad, eh?